Male. Taken at Abingdon, Oxon on February 23rd 2019. Male underside. Taken at Abingdon, Oxon on April 1st 2017. Female. Taken at Otmoor, Oxon on August 29th 2011. Female underside. Taken at Dry Sandford Pit, Oxon on July 12th 2018. Larva. Taken at Abingdon, Oxon., on August 17th 2013. 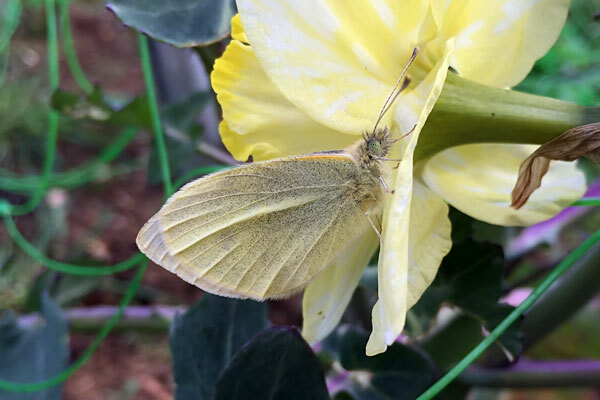 This species is one of the two known as the "Cabbage White". 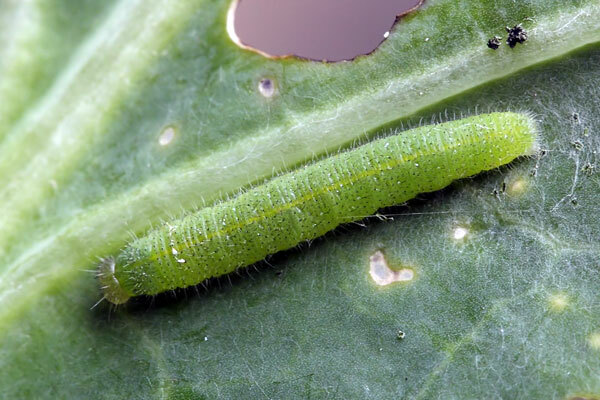 Its larvae can reach pest proportions, and decimate cabbages (and other brassicas) to the point that the leaves become skeletons, although they are not usually as destructive as those of the Large White. It breeds throughout the British Isles, except for northern Scotland, Orkney and Shetland. 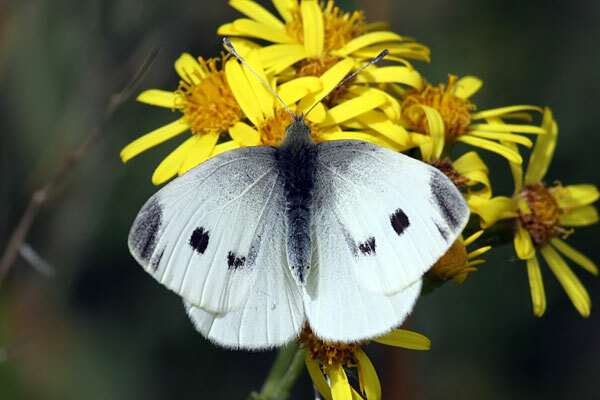 Small Whites can be seen almost anywhere and can occur in large numbers around fields of brassicas, and also gardens and allotments. There are generally 2 generations each year, with 3 generations in good years. First-brood adults typically emerge in mid to late April, peaking around the middle of May and gradually tailing off through June. The second brood starts to emerge in early July, although in good years it may emerge in late June and give rise to a third brood. The species overwinters as a pupa. 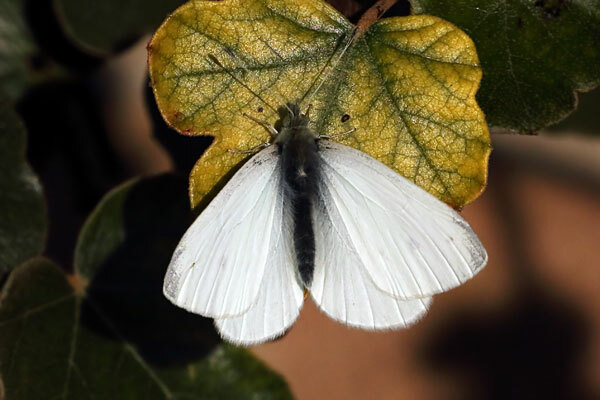 The female is distinguished from the male by the presence of 2 black spots on the forewing upperside; the male only has one. Second brood adults have noticeably darker markings that those of the first brood. The larval foodplants are cultivated brassicas, Charlock and Garlic Mustard. 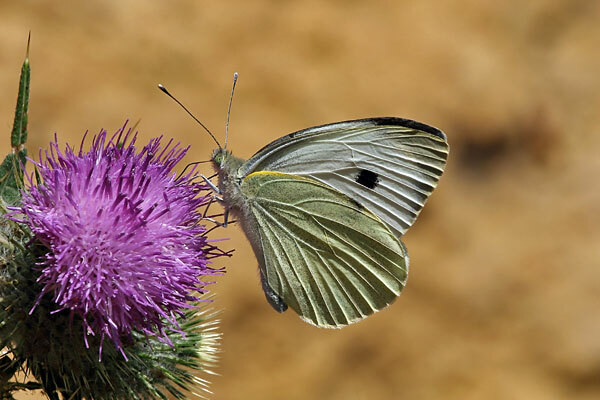 Adults feed primarily on Thistles, but a wide range of other flowers may be used.